Quick Definition: Anti-competitive practices are methods used by firms to reduce the competition in a market or industry. Anti-competitive practices are sometimes known as restrictive practices. They are methods used by firms in a market to restrict the competition. The main motive for these practices is to increase prices so the firms can benefit from higher sales revenue. 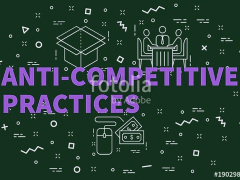 What are some examples of anti-competitive practices? Restricting output – This is when several firms in a market agree to restrict their production output in order to increase the average prices of the products they are selling. Market sharing/dividing territories – This is when firms agree to let individual firms control certain parts of the market (usually on a geographical basis) so that each firm can become a dominant supply in one part of the market. Price fixing – This is when firms in a market agree to set the same prices for their products. As a result, every firm who takes part in this practice will see an increase in sales revenue. Bid rigging – This is when the bidding of a contract for the sale of goods and services is predetermined by all the firms involved. Bid rigging begins with all firms agreeing that one firm will win the contract. This firm will then put a bid in that is slightly lower than all the other bids. Full-line forcing – This is when a supplier enforces its customers to buy their full product range, rather than just the products the customer actually wants to buy. Tie-in sales/bundling – This is when suppliers only sell certain products on the condition that other products are bought with it. Resale price maintenance – This is when a supply only sells a product to a retailer on the condition that it must be sold at a certain price. This method reduces the competition between retailers and means the supplier benefits from higher profits. Refusal to supply – This is a situation when a supplier refuses to sell its products to a retailer because the retailer is putting discounted prices on their products. Discriminatory pricing/differential pricing – This is when a firm sell its products at different prices to its customers depending on factors such as location, age etc. An example of discriminatory pricing can be found in the cinema industry. Tickets for students are cheaper than standard tickets. Dumping – This is a form of predatory pricing and is when firms export their product to another country at a price that is lower the costs of making the product. The aim of dumping is to force out any competition in the target country. Once this is done, the firm will increase their prices to a more profitable level. Predatory pricing – This involves setting unusually low prices with the intention of driving a competitor out of the market. Sometimes firms set their prices so low that they are lower than the firm’s cost of production. Limit pricing – This is a method similar to predatory pricing. It involves setting prices below a profitable level in order to put off firms entering the market. Exclusive dealing – This is when a retailer or distributor has to purchase their goods from one supplier. Imperfect competition – This is a term that describes any market structure between the extremes of perfect competition and pure monopoly. Duopolies, oligopolies and monopolistic markets are all imperfectly competitive market structures. Market – A market consists of buyers and sellers of a good or service. Market share – The share of sales in a market that a business or brand has. Calculated by dividing sales of the business by total sales of the market and multiplying by one hundred. Office of fair trading – This is an organisation that gathers information about the competitiveness of markets. Oligopoly – This is a market structure with a few very large firms which dominate the market and its output.